Not surprisingly, ground orchids are found growing in soil, unlike their tropical brethren that we are accustomed to thinking as orchids, for example the genus Cattleya. The name “ground orchid” itself is a misnomer, and even then the more technical term, terrestrial orchid, is in part inaccurate. The reason why has to do with the substrates these highly varied plants are found in naturally. Some are found in loamy soils of forests, while others colonize old sand dunes. Others still grow in boggy, peat-based mucks on seepage slopes or out on mats of peat bogs floating on old glacial lakes. Others can be found in mineral-based soils, such as Cypripedium californium which grows in serpentine soils of seepage bogs in northern California and adjoining areas of Oregon. The terrestrial orchids native to the pine rock-lands of south Florida’s Everglades region grow in a thin layer of organic debris overlaying pure limestone rock and marl. So again, we can see that diversity within any category of plants is often extreme, and generalizations are not adequate in describing them.Probably some of the best known terrestrial orchids are in the genera Bletilla, Cypripedium, and Orchis. Many have gotten the name hardy orchid because some colorful flowered species are found in temperate regions. Of course not all terrestrial orchids are from temperate climates, in fact, they can be found as far north as the Arctic Circle and all the way down to the very south end of Patagonia. They live in any climate zone, from tropical to subarctic. Not surprisingly, their cultural needs are equally as varied.The focus here then is about specific groups – their natural history, biology, and cultivation. It is this last point that is of great interest to many adventurous souls. I say this because if you travel down the road of terrestrial orchid cultivation, you are in for a ride, with lots of highs and lows. Virtually no terrestrial orchid is actually easy except for a handful – Bletilla striata and Spathoglottis plicata pop into mind. If your growing conditions are right, you will find many others that too could be called easy – genera such as Dactylorihza and Pterostylis have members that fall in that category. Many more are challenging – the vast bulk of the popular genus Cyripedium, many of the acidic bog species, and most of the tropical jewel orchids all need more care and attendance to than a typical tropical orchid. Others still defy cultivation completely, at least under normal growing conditions – these would include all of the chlorophyll lacking saprophytes, and yet others such as Cypripedium irapeanum and related species from Mexico and Guatemala. A rare few can be called truly weedy, but some in the genera Spiranthes and Cynorkis fit that bill.Fascinating, often strange, and sometimes familiar, this is another amazing group of plants to explore. Here’s a terrestrial orchid that is not only common, but can also take a fair amount of abuse and live to tell the tale. The bulbous rhizomes can be packaged for some months, completely rootless, and yet when planted they will grow on and even flower. Ironically, while this species is so easy to grow and is available at big box stores the world over, it also is very rare in the wild these days. Bletilla striata is a perennial, deciduous orchid of open environments. The grass-like leaves, numbering between 4-8, grow tightly along a central, thick stem to the height of 30-50 cm on average. The leaves are bright green and deeply ribbed, giving the overall impression of an unflowering plant as that of a typical palm tree seedling. 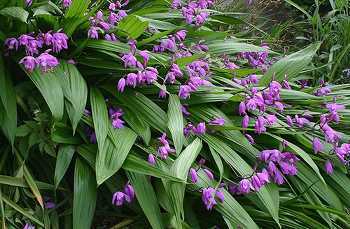 Bletilla striata can form clumps of a hundred or more stems. The flower stalk arises out of the top of the leaves at the apex of the main stem and can extend for another 30 cm or more. The typically pink-purple flowers occur in an alternating pattern along its length and open sequentually, yet several are in flower at any given time. The flower stalks start out in a vertical position, but as more flowers open, they tend to sag down and become horizontal to the ground. The author’s garden showing various color forms of Bletilla striata growing in one patch. 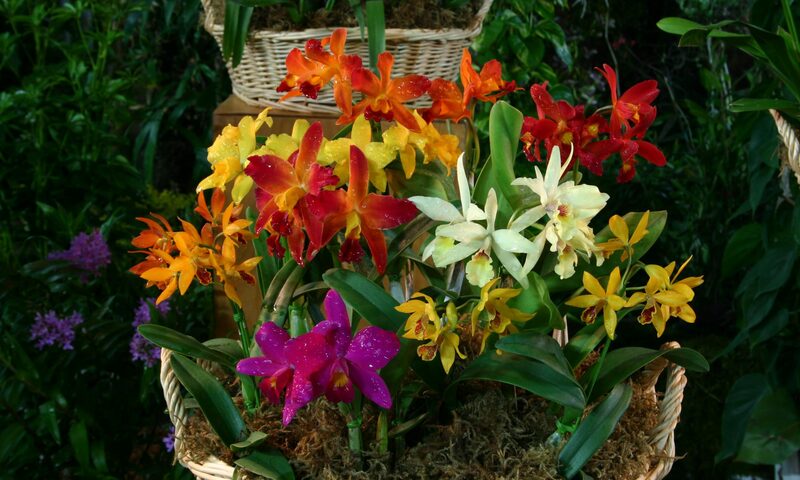 The flowers, which can number up to 10 or more per stalk, have a very classical orchid shape, something like a Cattleya, and are about 6 cm across. The sepals and petals are solid pink-purple and are of similar shape and size. The partially tubular lip is deeply ribbed with a ruffles at the end, and these are often streaked white. The column is long and descending, becoming broader at its tip. Plants quickly clump and individuals can number a hundred stems or more in time. In Japan this species typically flowers from April through May. Preferring bright environments, it can be found on forest edges, low mountain meadows, rocky cliff faces, marshlands, and along rivers in exposed, sunny environments. River “improvements”, and damn building has lead to the species becoming very rare in nature.